Two Tiered Fondant cake & Draped cake with case. This cake was kind of a challenge. The bottom cake was an 8" round and the top is a 6" round. 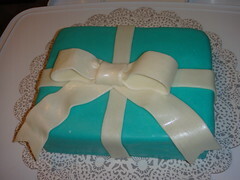 Now I understand why fondant cakes are so expensive. They make the cake look flawless, but it is a lot of work. I just used the Wilton Fondant to cover these cakes. After the mishap I had with the MMF, I didn't feel like going through that again. I rolled all of the border beads by myself. I have since bought a bead/pearl mold. The border really covers up the mistakes I made, and notice on the top tier there is a think pink band. 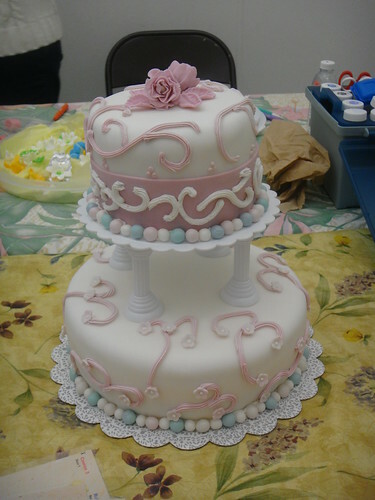 I did that because part of the fondant tore and I was covering it up=) The scroll work is all done freehand with buttercream frosting. The roses on top are made of gumpaste. I did a marbling color effect fondant covering on the cake, which you can't really tell because of the drape. If I remember correctly, the drape is a 50/50 mix of fondant and gumpaste. 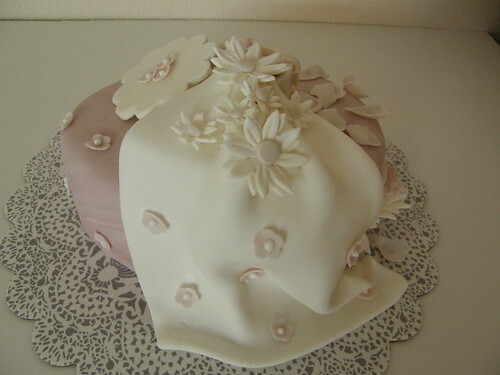 I added small flowers in the case and daises on top of the cake. On the other side of the cake are gumpaste roses and rose petals cascading down the other side. I thought I had uploaded the photo of the other side but I didn't. Sorry! These are a result from holding my daughter with left arm and decorating the cookies with just my right hand. Oh, and I only had white royal icing. I used leftover candy from our Gingerbread house. I'll do better next time. 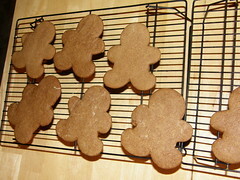 If your looking for a good gingerbread cookie recipe, I don't have one. I used this. 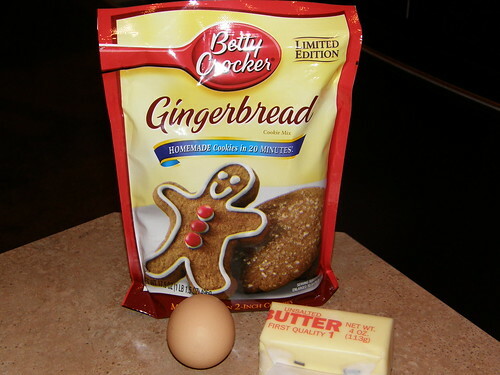 I love that Betty Crocker. I was skeptical too. 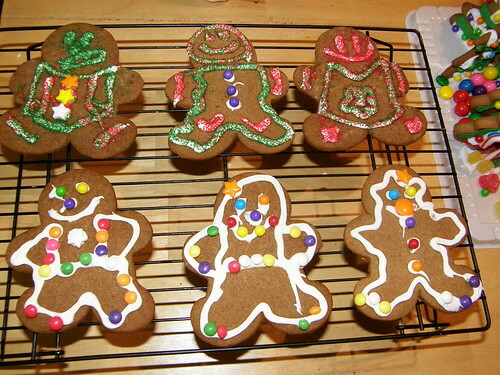 I just wanted to decorate the cookies, take some pictures. It just smelled soooo good. I had to have a bite. It was perfect. It was soft and it didn't have too much spice in it. It reminded me of when I was pregnant. I had read that ginger helps with the nausea. The only thing that helped was a gingerbread cookie from the San Francisco Street Bakery. I'm not much for icing. 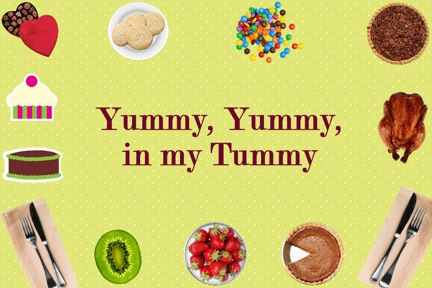 I'd rather eat it plain. I traced my daughter's hands on some paper, cut it and traced it on the cookie dough. I used store bought cookie dough. It was already rolled out and flattened. I think it was Pillsbury brand. It didn't taste good, our dog Sissy loved it. 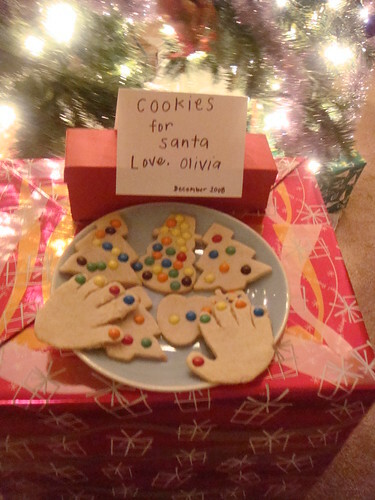 But the cookies turned out great. 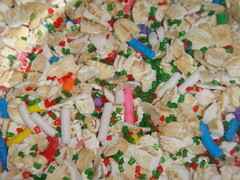 And what we have here is reindeer food. I didn't measure anything, I just went with what looked pretty. After that, I just threw some out the front and back door. 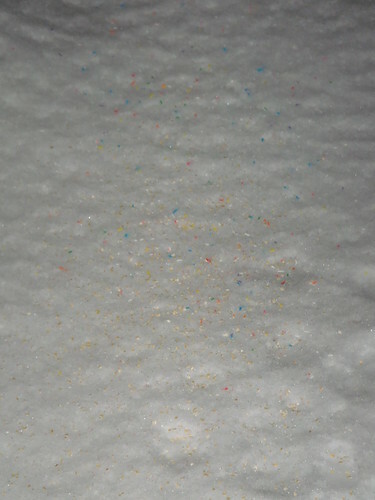 We had a thick blanket of snow. And the last tradition, which I am probably going to need to tweak a little bit is this one. It was a disaster. 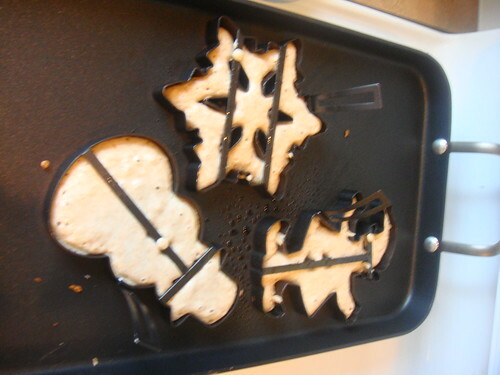 Note to self: Do not use whole wheat pancake mixes when using pancake molds. 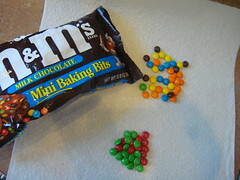 Oh, and don't add m&m's to it either. 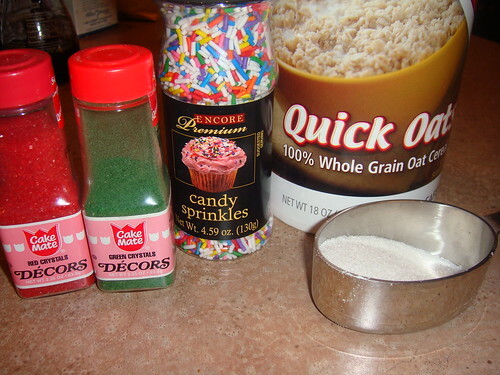 Do it with regular mixes. 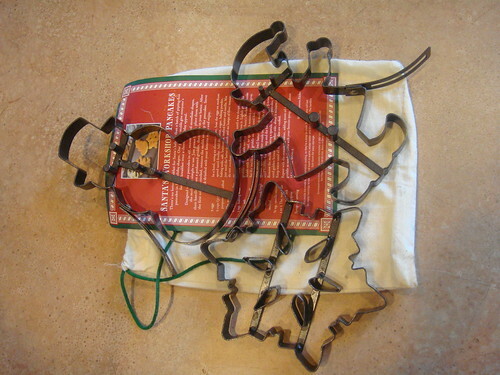 I used these molds I bought from Williams-Sonoma on Black Friday last Thanksgiving in California. I thought it was cute. Now I just want to throw it across the room. The batter just gets stuck! It made me so mad. I even separated the M&M's to make it more Christmasy- if there such a word. But anyway, I put the candy on only the Snowflake mold. You can see it turned black! And here it is getting stuck to the mold. Yes, I sprayed it with Pam and I sprayed it real good too. So don't be tempted to buy this mold if you see it at Williams-Sonoma. Well, you can if you want to but I hope you have better luck than I do. 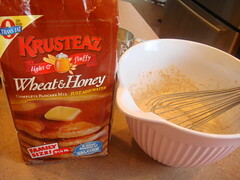 I actually tried it with the regular Bisquick mix, it was better, but it still got stuck. 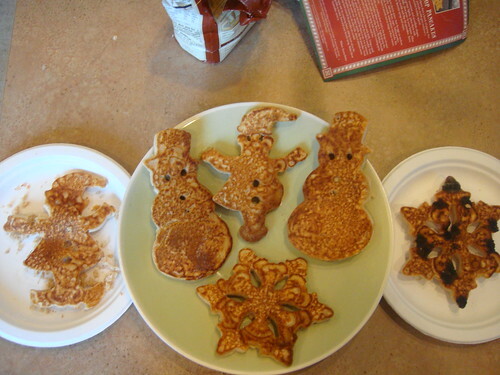 I ended up making regular pancakes. So I guess next Christmas Eve I will do regular pancakes with green and red M&M's. My husband wanted me to cook something fast and simple so we could spend time as a family during Christmas. This meal was so easy and so yummy. 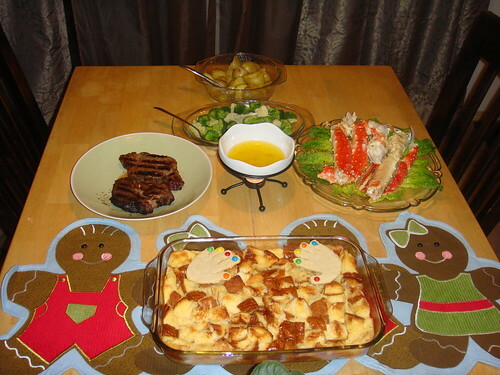 I made the eggnog bread pudding the night before (I will post the recipe). The steaks took about 14 minutes to grill. 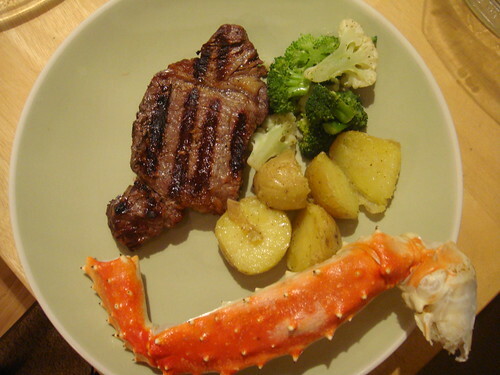 The crab legs were frozen and I steamed it about 20-30 minutes before we had dinner. The veggies and potatoes were nuked in the microwave. Fresh veggies were seasoned with salt & pepper, a little bit of adobo seasoning, and some olive oil. Microwaved it about 3-4 minutes. Medium yellow potatoes were microwaved for 8 minutes, then halved and topped with salt & pepper, and some butter. Easy breezy.